Today is a great day! I’m excited and proud to announce that as of February 1st, 2019, I’m joining Microsoft. I will join the Microsoft Azure Engineering team as a Senior Cloud Advocate. After being a Microsoft MVP for 7 years and working very closely with Microsoft the last couple of years, this is a great new opportunity and an exciting time ahead. My role is part of the Microsoft Developer Relations group and more specific the Cloud Advocates. I’m joining the team of Rick Claus, which many of you know from Channel9, Microsoft conferences and his overall work at Microsoft. Our team is focused in the IT Ops and IT Pro community. This allows me to do what I love most, which is being an advocate for customers in the Azure product group, sharing knowledge and engaging with the community. We are advocates for the IT community within Microsoft. Using the products, listen to customers and help the product teams to prioritize their work. 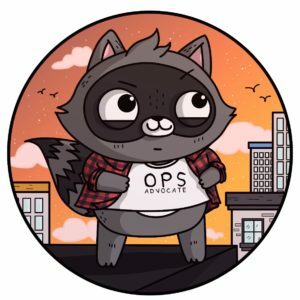 We develop tools to help use the products, we write documentation and tutorials, and we build connections between the community and the engineering teams. Our team’s charter is to help every technologist on the planet succeed, be they students or those working in enterprises or startups. We engage in outreach to developers and others in the software ecosystem, all designed to further technical education and proficiency with the Microsoft Cloud + AI platform. A large part of our mission is to make Microsoft Azure the best platform to run your applications and services, as well as making migration to the Microsoft Azure ecosystem simple. Our team looks for common pain points and works with the product teams to address them. In other cases, we build the missing pieces like tools and documentation. My focus is going to be on the Azure and Microsoft hybrid cloud strategy. Besides the Azure services, this will include products and services like Windows Server and Azure Stack. Which will help bringing that consistent cloud experience to life, so our customers can make the best out of the Intelligent Cloud and the Intelligent Edge. If there’s anything you would like us to improve reach out to me or to our team. We listen to your needs and take your feedback into consideration in our future developments. 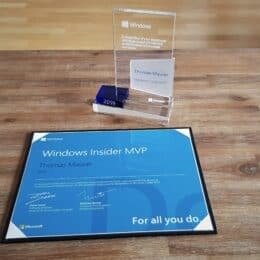 I am proud to share with you today, that I received the Windows Insider MVP Award from Microsoft, for my contributions in the Windows community in the past year. The Windows Insider MVP award is an additional award to the Microsoft MVP award. It was created and announced in 2016, and is focusing on Windows and Devices for consumers. It is an honor to be awarded for my work and contributions in 2018. Congratulations! Thank you for your contributions to the Windows community, we are excited to welcome you as a Windows Insider MVP. This award is a token of our appreciation, your leadership and passion help make Windows the best yet. We look forward to collaborating with you and all of our Windows Insider MVPs as we continue to strengthen the Windows Insider MVP (WI MVP) Program. Working with the Windows community to share the latest an greatest about Windows 10 is just a lot of fun. The Windows Insider team as a fantastic job with enganging with the community and work with people all over the world, to make Windows better. 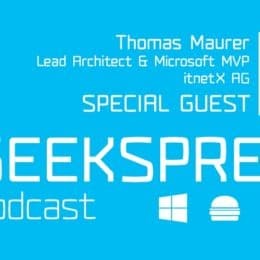 Microsoft just released Windows Server 2019 to the public and with that I was invited to be a guest in the GeekSprech Podcast from Microsoft MVPs Eric Berg and Alexander Benoit. We talked about the Windows Server 2019 release and what great new features in this release. We also got off topic and had some chats about security, Azure Stack and more. It was an honor and a lot of fun talking with Eric and Alexander! I am back from some great travel and speaking opportunities like Experts Live Europe 2018 last week. That said, I’m happy to speak at the E2EVC Conference in Athens this week. E2EVC stands for Experts 2 Experts Virtualization Conference, and brings the best people together to talk about virtualization. This will be my 11th E2EVC, I was speaking in many events since 2012 in cities like Rome, Hamburg, Dublin, Copenhagen, Brussels and last year in Prague. I am really happy to speak at this event again. In my session I will speak about the great new feature in Windows Server 2019. Join this session for the best of Windows Server 2019, about the new innovation and improvements of Windows Server. Learn how Microsoft enhances the SDDC feature like Hyper-V, Storage and Networking and get the most out of the new Azure Hybrid Integration and Container features. You’ll get an overview about the new, exciting improvements that are in Windows Server and how they’ll improve your day-to-day job. In this presentation Thomas Maurer (Microsoft MVP) will guide you through the highly anticipated innovations in Windows Server 2019 and the Semi-Annual Channel including: ○ Windows Server Containers ○ Azure Integration ○ Hyper-V features ○ Storage ○ Networking ○ Security ○ Windows Server Containers And more! E2EVC Virtualization Conference is a non-commercial, virtualization community event. 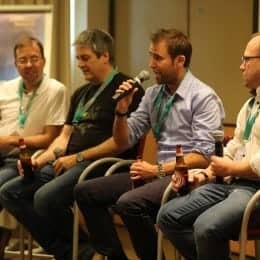 The main goal of the E2EVC is to bring the best virtualization experts together to exchange knowledge and to establish new connections. E2EVC is a weekend crammed with presentations, Master Classes and discussions delivered by both virtualization vendors product teams and independent experts. I am happy to be part of the community and listen to other industry leading experts. I am looking forward to the E2EVC and hopefully see you in Athens. I am proud to announce that I was awarded today by Microsoft, with the Microsoft Most Valuable Professional (MVP) Award for 2018-2019 in two major categories Cloud and Datacenter Management and Microsoft Azure. This is my 7th Microsoft MVP award since 2012, and I couldn’t be more excited about this one. 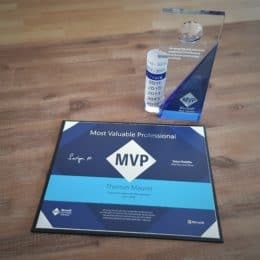 The Microsoft MVP award title is a huge honor and it stand for the contributions I have been doing in the IT community as an Microsoft expert for the past years. 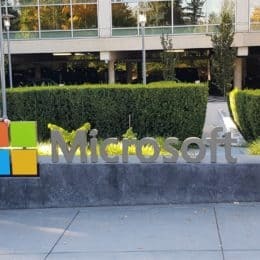 The Microsoft MVP award also comes with some benefits, like a NDA and access to the Microsoft Product Groups, as well as the yearly Microsoft MVP Global Summit on the Microsoft Campus in Redmond. But one of the biggest benefit overall is that it gives you the opportunity to speak at different conferences all over the world. This and having the chance to speak with people from all over the world, which share the same passion is priceless. I need to thank many people which are helping me to achieve this and making the most out of it. I would like to thank my employer itnetX which is supporting me in the best possible way all these years, my current and former colleagues from which I can learn a lot, the Microsoft MVP community and of course Microsoft employees in Redmond and all over the world, to work with us and collect feedback. Last but definitely not least, I have to thank my girlfriend, which not only helps me out with many things, but also needs to be patient, with my extra work so many times. She is also one of my biggest and also most critical supporters. She helps me to understand things better, promote my activities better, fixing my blog post 😉 and makes all the traveling more joyful. If you want to know more about the Microsoft MVP Program, check out the Microsoft Most Valuable Professional website. As you might have seen we at itnetX are heavily pushing Hybrid Cloud with Microsoft Azure and Azure Stack. 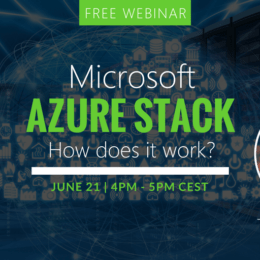 Besides our webinar series about Azure Stack, we are working together with Microsoft and HPE to present the Azure Stack solution at a live event in Geneva. Attendees will first have the chance to have a tour trough the HPE Customer Innovation Center, and after that itnetX and HPE will present two session about Microsoft Azure Stack, followed by networking and drinks. 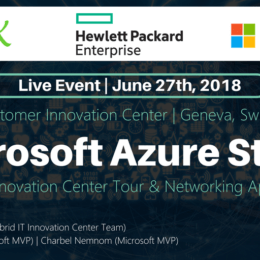 If you are interested to learn about Azure Stack from itnetX, Microsoft and HPE, join the Microsoft Azure Stack Customer Event at the HPE Customer Innovation Center in Geneva on June 27th. I will be speaking together with Charbel Nemnom (itnetX and Microsoft MVP) and we will be joined by Christine Perrin (HPE Presales Consultant, Hybrid IT Innovation Center team). By Charbel Nemnom & Thomas (Microsoft Cloud & Datacenter Most Valuable Professionals) Microsoft released Azure Stack as an Azure appliance for your datacenter. Learn what Azure Stack is, what challenges it solves, how you deploy, manage and operate Azure Stack in your datacenter. Discover the features and services and how you can build a true Hybrid Cloud experience. In this presentation, Charbel Nemnom and Thomas Maurer will guide you through the highly anticipated innovations and experiences during the Azure Stack Early Adaption Program and Azure Stack Technology Adoption Program (TAP). The Customer Innovation Center environment is designed to help you get an end-to-end understanding of the HPE portfolio and partner eco-system capabilities. As part of the Microsoft Azure Stack event, you will be able to explore different showcase areas including the industry zone presenting live intelligent edge uses-cases, the transformation zone with a see and touch experience on products, technology in action with a tour within the modular Datacenter (MDC) and finally the success gallery. The operation of Azure Stack requires a lot of know-how: special business processes have to be established. The infrastructure requires a high degree of monitoring and capacity planning and the offered services must be configured and optimized continuously. During two sessions, HPE and itnetX will share their expertise knowledge on the entire operation of the Azure Stack infrastructure and will provide you with useful insights into how to successfully integrate, manage and operate Microsoft Azure Stack. Together with itnetX we are starting a couple of webinars on Microsoft Azure Stack. I am happy to announce that I will be speaking in the first webinar about Azure Stack, what it is, what are the use cases for it and how you can leverage it to build a true hybrid cloud. The free webinar will take place at June 21, 4pm-5pm CEST and will be held in English. In this session, Thomas Maurer will talk about Microsoft Azure Stack. Learn what it is, what it is meant for, and discover the real Microsoft Hybrid Cloud benefits, delivered by Azure Stack! In the second Azure Stack webinar, my colleague and friend, Charbel Nemnom (Microsoft MVP) will talk about how Microsoft Azure Stack is integrated into your datacenter, how it’s operated and how it can be used to offer services to consumers. Besides that, he will also dive into the Azure Stack Development Kit, a free single-server deployment option that lets you test Azure Stack and prototype your applications and services before you commit to purchase Azure Stack.